Disable the logic introduced by the above commit on i386. Low, the above commit introduced a new feature. Per upstream, the result of not having this feature results in higher CPU usage and potential buffering issues in user space. system then becomes unresponsive; no further interfaces can be created. Only seen on i386; all other archs pass OK.
See the same without proposed (i.e. I don't think its the version of ovs in proposed that's causing this problem). Is this issue new in bionic? Do you you happen to know of a prior kernel version that does not exhibit the bug? linux-generic is already the newest version (4.12.0.12.13). That was for the 2.8.0-0ubuntu1 upload during artful development. Testing with the mainline kernel I don't even get as far as the original error - the instance I'm testing with locks up as soon as the performance test is executed. so maybe this is something that ovs is doing that's breaking the kernel. so the issue appears to be the combination of ovs 2.8.1 (and 2.8.0) with the 4.13 kernel. Can you see if using earlier kernel versions makes the bug go away? I don't have a data point for 4.11, but at 4.10 (as shipped in zesty) ovs 2.8.1 tests are OK. Looking at the test history - artful passed tests with 4.11 and 4.12 kernels with 2.8.0, but appears to have started failing sporadically when 4.13 entered the archive. Would you be able to test some test kernels? If so, we can try to bisect down to which commit introduced the regression. Joseph - would it be possible to get a 4.13 kernel prepared with the patch identified picked? @Greg, do you happen to know which commit in that merge is the actual fix for this bug? I tried to build a test kernel with the patch set from Cong mentioned in comment #18. However, there was a build failure due to some missing prereq commits. I also had to backport many of the patches, since they were not clean cherry picks. Per comment 16, the bug did not start happening until the 4.13 kernel was introduced to Artful. We may want to look for a commit to revert instead of Congs patch set, since it may not pass all the SRU requirements. I'll create a VM and see if I can reproduce the bug. If I can, I'll bisect down the offending commit in 4.13. Just to confirm, this is only happening on the i386 server release? Attached is a screen shot of the hang. It seems to be trying to boot the image. Also, I'm trying to run this on a VM instead of bare hardware. Could that be an issue? That could be an issue - for 2nd level being famous for only working mostly. But why would you do so - since the tests are in VMs they are already more or less host release agnostic. You can run that on any host system - although in general having "autopkgtest" from $RELEASE-backports is often a good idea. Just ran a check if buildvm works for me atm, and it did with the same cmdline you had (Xenial + autopkgtest backport) - it "appears" to hang at that stage, but is done after ~1-2 minutes. In 2nd level that could as well be just way more inefficient and take much longer? @Christina, Thanks for the info. I am now able to reproduce the bug using your steps. Thanks again for that! I'm going to dig deeper into this and see if I can bisect down to the commit that caused this. I next need to figure out how to swap in different test kernels. I think you explained how to do that in the duplicate bug, so I'll take a look there. I'll post an update shortly. mount: /mnt/test: special device /dev/nbd0p1 does not exist. Welcome to fdisk (util-linux 2.30.1). fdisk can see that the nbd device has one partition, but I can't seem to mount it. Any suggestions? 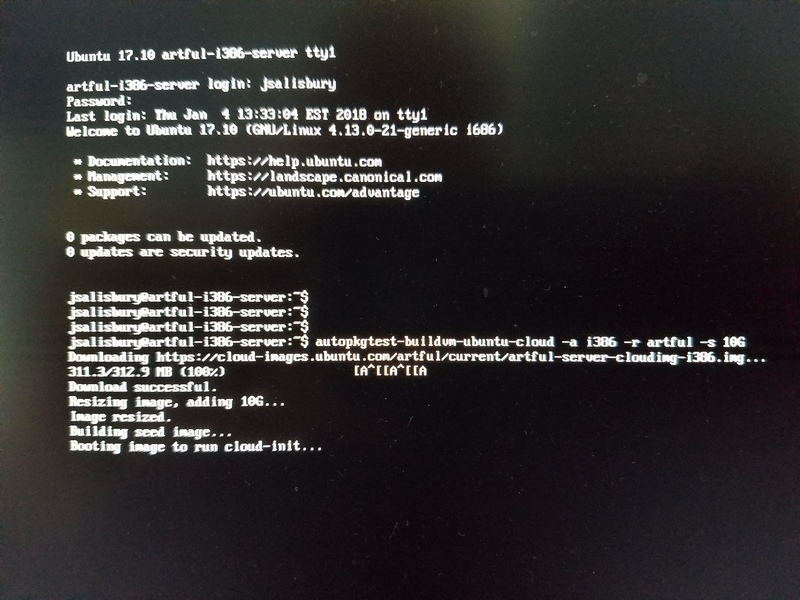 Is there a way to modify the autopkgtest command line to tell it which kernel to boot? When I have multiple test kernels installed, I usually just select them from the GRUB menu. What would be the equivalent here? If that works for you fine. > just select them from the GRUB menu. What would be the equivalent here? If you really want to bisect you might want to go a step further. work without having the kernel actually installed). Once set up in a way to work you could really bisect through that. times - so your choice what you prefer. Thanks for the feedback, Christian. I would much rather install them manually. I am able to do that without a problem. However, I am unable to access the GRUB menu in the usual way to select a specific kernel. I tried all the usual way, holding shift, modifying /etc/default/grub setting, but none seem to work. @James Page, how did you tell your image to test the mainline kernel in comment #6? Do you identify the position of the new kernel in /boot/grub/grub.cfg then modify GREUB_DEFAULT in /etc/default/grub to this number? > to access the GRUB menu in the usual way to select a specific kernel. > setting, but none seem to work. I had a zesty testbed to remove anyway, so I could kill it if needed. By default it does boot "4.8.0-26-generic"
nothing special in my try. And I'd assume that could as much appear on real HW. I hope that helps to drive your test kernels. Thanks for the feedback, Christian! This gives me enough to be able to try and bisect this issue down now. I'll post an update shortly. The 4.10 based kernel does not experience this hang, but I am seeing it with 4.12. Maybe the 4.12 based kernels does in fact have the bug. I'll test further to find out. After some more testing, it appears v4.11 final does not have the bug. Version 4.12-rc1 appears to be the first kernel version to hit the bug. I'll run a few more tests to confirm this. Once confirmed, I'll start a bisect between v4.11 and v4.12-rc1. Any update on your bisecting? I'm still working on bisecting the issue down. I should have another update in a day or two. Marking OVS tasks as invalid as we think this issue is in the kernel. However, because this commit is a merge, I have to perform another round of bisecting between this commits parents. I'll have another update shortly. I'm still in the process of bisecting this. Some of the testing that did not exhibit the bug, does sometimes. I need to run through the prior testing I did to confirm whether the kernels were really good or bad. I'm still working on the bisect. It looks like two commits may have introduced the bug, which is slowing the bisect process. Reverting this commit allows the tests to work just fine in v4.12, which freeze without the revert. This is allowing me to bisect into newer kernel versions now. I'm bisecting further now to identify the commit that is causing the trace with igmp_group_dropped as the EIP. Be sure to install both the linux-image and linux-image-extra .deb packages. neither me nor James have realized that this waited for a retest on our side. Would you mind prepping a new test kernel of your choice (This still is an issue in cosmic, so whatever works best for you is ok) so that we can check and verify if it helps? While faster in the crash with more CPUs I eventually reduced to 1 to have better (more clear) stack traces. It hangs (tests POV) and crashes (main console running dmesg -w). The test kernel works fine where the other one failed. To be sure I ran it multiple times and with different cpu options enables in KVM (e.g. to also run the DPDK tests which need sse3). But they all worked, no crash. That said - yes reverting that change seems to be the solution. Yet for what was it needed and what would break if it is reverted? openvswitch: Add eventmask support to CT action. types of events are of interest. to extension not being found. That is odd, I thought in the past we had identified an Ubuntu-sauce patch, but that is a normal upstream change. I'd hope that other are affected as well and this is fixed, or could it be that we are affected by 1206455 due to some Ubuntu-sauce? For the sake of checking if latest upstream (no sauce and 4.19-rc3) might be better I ran the latest mainline kernel. But that is crashing still. @James: can you estimate what we loose on non-i386 when reverting that change for now? @Joseph: what would we do now, report upstream - if so what exactly a description and link sent to the author and the ML as we don#t have a fix yet? Hi Joseph, due to some maas accident I got my test system destroyed by a coworker. I tested v4.19-rc3 as I wrote in comment #51 - do you mind accepting that as a valid "test latest mainline" even thou it was not -rc4 as it would be now? That should be good. I just like to have the latest mainline already tested in case upstream asks for it. I'll ping upstream and see what the next steps should be. you think gathering any additional data will help diagnose this issue? Seems to have no "special" version suffix to identify it other than #40 and build time. But #40 and the build time indicate this is the provided test kernel. With that kernel it still fails. Hmm, so are we giving up on this? There is an openvswitch related issue, bug 1813244. Perhaps these two are identical? I've done a test with the fix from bug #1813244 and the problem doesn't seem to happen. Probably a duplicate bug.